The next morning Dad has a full breakfast ready and waiting for me. 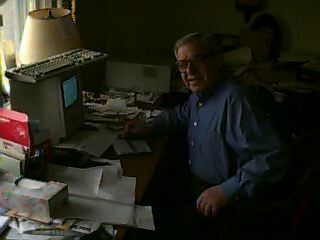 I spend most of the next few hours cleaning up Dad's Mac Plus and setting up an America On-Line account. Now he's got something to do on his computer besides writing his memoirs. And he and I can keep in touch more easily (for me, that is). We call up the San Francisco store to get the UPS shipper number, and call UPS to determine that the PowerBook isn't scheduled to arrive until tomorrow. In the late afternoon I give my Dad a hug and head off to my Mother's place, ten minutes away by car. She's on the phone and busily cooking dinner when I arrive. We get a very nice hour or two for quiet reconnection; we haven't spent this much time in conversation for at least a year. As we're downing some delicate tea, Emil, her husband of several years walks in from the garage, having parked the car after commuting from the office. He joins our conversation, drinking a beer in a large, clear glass. Then it's time to finish making dinner. Emil combines the salad dressing ingredients and shakes together something tasty. He then walks outside into the cool night air and fires up the propane hibachi to cook the thin chicken filets my Mom's been marinating. The potatoes are mashed, the gravy is made, and we sit down to a beatifully arranged table complete with candles and wine. The night is dark, and the cold from the windows penetrates the room just a bit, but the heat is on, the food is delicious, and the conversation is comforting. Dessert comes, and the evening is over far too soon. I promise to try and make it tomorrow, Dad's dinner arrangements permitting.